There�s no hope! Is there? Though your comrade is drunk and passed out, he�s not in any danger. But you are! Trapped in the Engine Room you must fix the pressure before the entire submarine blows up and you with it! 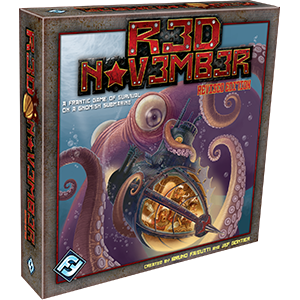 Red November is a cooperative board game for 3-8 players (1-2 with optional rules) in which you control desperate sailors in a frantic race against the clock. Each turn is just borrowed time. Gnome sailors move around the sub and fix the most pressing problem they can, but everything takes precious minutes that trigger more disastrous events. Work together to complete tasks as efficiently as possible until help arrives and the gnomes are rescued. While retaining the best aspects of the original Red November, the revised edition of Red November provides players with a few simple updates that will improve their playing experience. Red November introduces a larger game board, Item cards, and clarified rules. In Red November there are many ways to die, but only one way to win. Are you gnome enough to face the challenge?